It's winter, which means it's time to boost our daily moisturizer. In the summer, I can get by just using lotion at night. But not in the winter. In the winter, I have to use lotion a few times a day so my skin doesn't get scaly and itchy. Did you know there are some best ways to apply lotion for best results? If you follow these rules, you'll get more benefits from your lotion. Speaking of lotion, we use Lubriderm lotion. It's a no frills, no fuss lotion that may seem boring, but that's okay. Even if we aren't boring people, it's okay to use a boring lotion. I picked up Lubriderm at Walmart during my weekly shopping trip. It's on Rollback right now, so it's a great time to stock up. Everyone has different needs, so what works for one person won't necessarily work for someone else. 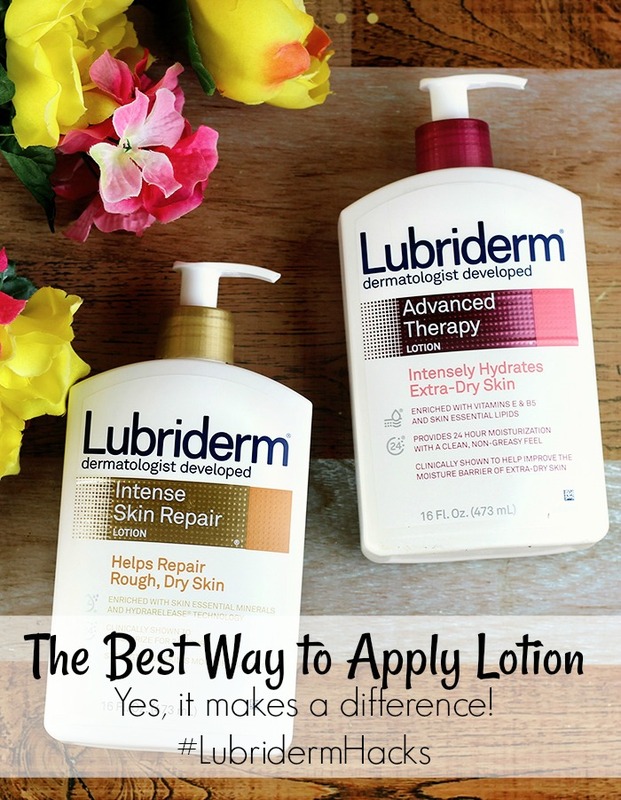 Lubriderm has several formulas, so you can choose the right one for your skin. My daughter, son, and I have dry skin, so we use Lubriderm Advanced Therapy for Extra Dry Skin and Lubriderm Intense Skin Repair Lotion in the winter. In the summer, we use Lubriderm Daily Moisture Lotion because our skin isn't as dry. They also have formulas for sensitive skin, fragrance free, SPF, and a light fragrance for men. As soon as you step out of the shower, the air starts stripping moisture from your skin. Use a towel to gently pat yourself to remove excess water, but don't dry off completely. Keep your skin slightly damp so when you apply moisturizer, it will hydrate your skin. Ideally, you want to moisturize with Lubriderm within five minutes of getting out of the shower. If your skin is really dry, don't open the door until you've applied lotion. Trapping the humid air will help keep your skin moisturized. The heat will also keep your pores open, which means better absorption. You probably shaved during a shower, so you'd put lotion on anyway. But just in case you wanted to skip it or didn't shave in the shower, you should use Lubriderm after you shave. Shaving removes not only your hair but also the top layer of skin cells. Your skin will absorb more lotion after you exfoliate, which is basically what you do when you shave. Using lotion also helps protect your skin after shaving so it doesn't get dry, and it can even help prevent ingrown hairs. When you wash your hands, the hot water, soap, and cold the cold air afterwards can lead to dry skin. Using a lotion every time you wash your hands helps protect your skin and prevent it from getting dry. It's best to protect your skin before you head outside in the elements. If you are going for a run or will be working outside, use a lotion on exposed skin before going out. Lubriderm Daily Moisture SPF 15 is a great choice if you'll be in the sun. I apply lotion every night before I go to bed. When you sleep, you lose moisture through your skin. This helps prevent dry, itchy skin when you wake up. Don't forget to use lotion on your feet and hands before you go to bed. And now you know the best way too apply lotion. Don't forget to get Lubriderm at Walmart while it's on Rollback. With the Rollback and Lubriderm Walmart coupon, you can save over 40 percent!